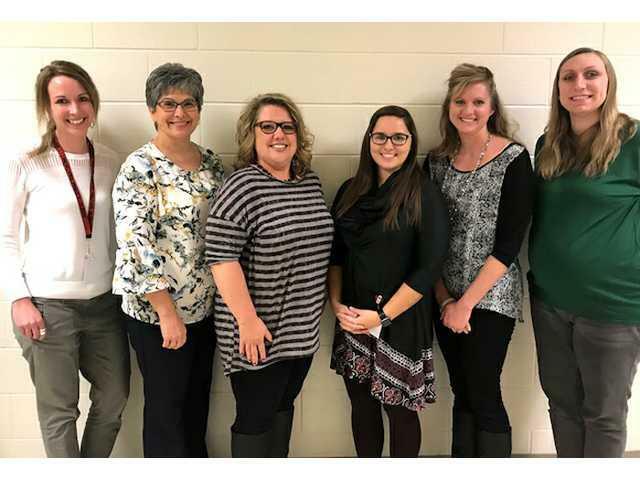 The Trauma Sensitive Team consists of from left to right, Katelyn Oellerich, Michelle Savatski, Lori Nodorft, Mariah Whalen, Jamie Hartwig, and Kelly Rose. POSTED December 7, 2017 9:45 a.m.
Lori Nodorft, the Guidance counselor at Darlington Elementary/Middle School (DEMS), began thinking last year about how students’ mental health affects them in the schools. Mental health has become a huge issue in the news lately and Nodorft wanted to find out how to help. She wrote for a grant to participate in a Trauma Sensitive School Initiative and she, along with other staff, are now teaching the rest of the teachers, staff and assistants at DEMS how to help students that may have experienced any type of trauma. “Educators are aware that many of their students face or have faced adverse situations in their lives that may negatively impact their ability to learn at school. Becoming a trauma sensitive school allows staff members to become more sensitive to these needs of these students and make their classrooms a safe and secure environment,” Nodorft said. The trauma can be anything from the death of a family member or physical or mental abuse. Making these classrooms a safe haven for students can make their experiences happier and easier to succeed in school. Darlington is the only school in the area that is participating in this training or anything similar. The Darlington School District will spend the entire 2017-2018 school year attending trainings and workshops where they will learn how to make the district “Trauma Sensitive”.